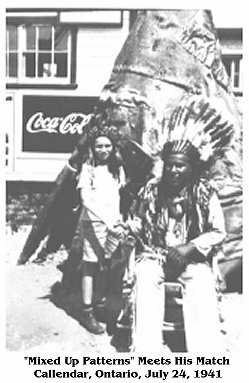 "Mixed Up Patterns", was wearing a Plains Indian headdress and standing in front of a tepee (teepee, tipi) when I met him. [It would have been slightly more correct and less ridiculous for him to be using a wigwam (wigwaum, wikiwam) of the woodland natives.] At age 11, I advised him that his actual dwelling should be a "longhouse" and he should forget his feather bonnet. He sputtered at this boldly affronting remark and, then smiling, inquired if I wanted to be photographed with him or not. He plonked a moth-eaten head band on me and our meeting was recorded for posterity. I believe that "Mixed Up Patterns" was a Mohawk descendant of Chief Joe Brant, famous leader of the Six Nations Confederation (also known as the League of the Iroquois). He received his name from an early Ontario psychologist who was studying behavioural patterns amongst the people of the first nations, because he was so difficult to pidgeonhole into a single descriptive pattern of behaviour. The older brother of "Mixed Up Patterns" was quite impossible to label, having failed all of the tests. Therefore the tribe selected "Mixed Up Patterns" as its Chief. The older brother was so angered by this act, that he stormed off to the Rocky Mountains between Alberta and British Columbia, where he took out his frustration by hurling boulders at passing motorists from the tops of the mountains. ... Actually, that is how the older brother received his name of "Falling Rocks". To this day, The Ministry of Transport posts signs in his memory along the Trans Canada Highway ..... BEWARE OF FALLING ROCKS. During our trip with the Canadian Massed Pipes and Drums to Scotland in 2009, Pat and I walked around Arthur's Seat a few times. There were numerous signs along the paths to warn climbers about the danger of falling rocks. 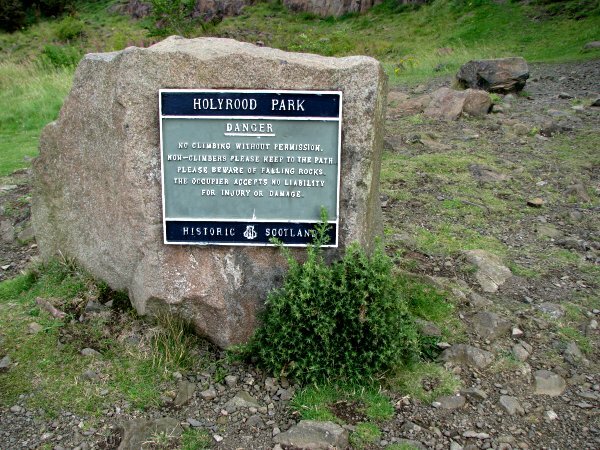 This particular one was across the road from Holyrood Park, the site of The Gathering. I didn't realize that the tale of Falling Rocks had spread this far.